Eaves troughs, also called rain gutters, are an integral part of a roof system. 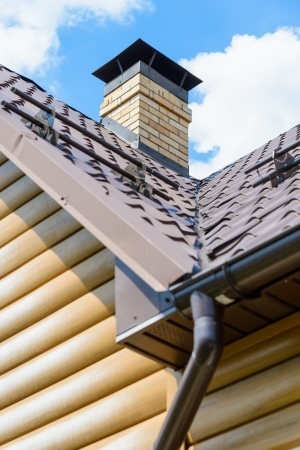 Eaves troughs redirect the snow and rain water that is shed off the roof away from a home’s foundation and other places where exposure to water can cause extensive damage. Clogged eaves troughs and downspouts can flood basements, rot and ruin siding, crumble mortar joints, and cause ice jams to form during the winter. It’s important to inspect your eaves troughs at the beginning of winter and spring to avoid damage to your home, and to prevent costly repairs. Signs that eaves troughs aren’t operating properly are pooling water at the base of a home’s foundation, cracked, streaked or peeling siding, and a damp or flooded basement. These problems can be a result of clogged or sagging eaves troughs, faulty mortar joints, and even poor installation. If damage to your eaves troughs is visibly apparent, parts of the system or even the entire system may need to be replaced. Bi-annual maintenance is often the best practice for well-functioning eaves troughs, and most home owners can do this with a few household tools. To clean leaves and other detritus from your eaves trough system, simply use a whiskbroom that fits into the shape of your gutters and rinse with a garden hose. And don’t forget to wear gloves to protect your hands! This entry was posted in Roofing Accessories and tagged Eaves Troughs, Gutters, Rain Gutters, Roof, Roofing. Bookmark the permalink.